The Mayor and Transport for London (TfL) have announced £4 million of funding for Biking Boroughs like Ealing to create cycle hubs and cycling communities in outer London. The funding will help boroughs engage the local community in cycling, create better cycle infrastructure and parking as well as making cycling safer. Ealing was one of 13 boroughs awarded Biking Borough status in 2010 and received £25k to develop their Biking Borough strategy. The borough has pledged to put cycling at the heart of their local transport delivery plans. The aim is to create a local culture of cycling with a focus on creating cycling hubs in town centre locations or key areas in the borough where the potential for increasing cycling is greatest. They will also receive extra support and expertise from TfL in a bid to encourage greater numbers of cyclists in their areas. From Monday 21 February Ealing will have the opportunity to bid for a share of the £4 million funding. TfL will assess each submission and award funding accordingly. £4m could pay for 40,000 new on-street cycle parking spaces or fund the training of 200,000 lorry drivers in safety and awareness of cyclists. Alternatively the money would cover training courses for 66,000 cyclists or 100km of quiet cycle routes in suburban areas. The decision as to what combination of cycling improvements the money would pay for will be made by the individual boroughs. 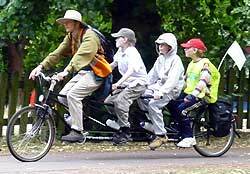 Boris Johnson, the Mayor of London, said: “I promised a cycling revolution for the whole of London. This funding will enable our friends in Ealing to develop exciting ways to make cycling bloom in their borough making it easier to replace some short car journeys with pedal power. I want people in outer boroughs like Ealing to be breathing better quality air on less congested roads and we all want an economic boost to our local shops and town centres. I believe developing Biking Boroughs can make this happen." Ben Plowden, TfL Director of Better Routes and Places said: “Research shows how more than half of the trips in the Capital that could be made by bicycle are in Outer London - a total of 2.4 million journeys a day, most of which are currently made by car. “Thousands of short trips made in outer London every day have the potential to be cycled, which is why we will be working with 13 boroughs to pave the way in encouraging a shift to two wheels.